The Jungle Book 1 oz silver coin collection from the New Zealand Mint celebrates the 50th anniversary of this much loved Disney film, which was released on 18 October, 1967. Based on Rudyard Kipling's classic tale it was met with great praise by the critics and became one of Disney's all-time box-office winners. There are four 1 oz fine silver coins in the collection. Each 1 oz silver coin features a classic image of Mowgli with another key character from the film, namely Baloo, Bagheera, Shere Kahn and King Louie. The artwork for all four silver coins is featured in full color with selected engraving. All four 1 oz silver coins are nestled in velvet inside themed, antique-looking story-book style packaging. The delicate embossed pattern on the front cover is inspired by Disney's The Jungle Book. The Certificate of Authenticity is found inside the front cover and provides further insight into the film and the characters featured on the coins. This unique and limited (only 10,000 sets minted) silver coin collection would make a great gift for any Disney fan or coin collector! 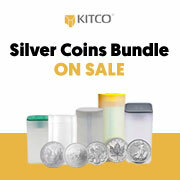 Buy your 4 x 1oz Silver Coin Set--The Jungle Book 50th Anniversary from Kitco today!